Nostalgia Digest Magazine is a 64-page quarterly publication filled with articles about the "Golden Age" of radio, television, movies, and music, written by those who lived it and those who love it! For more than 40 years, Nostalgia Digest Magazine has provided readers with an entertaining, educational look at life and popular culture during the first half of the 20th century (and sometimes beyond). In addition, every issue of Nostalgia Digest includes a three-month schedule for Those Were the Days, our weekly old-time radio show hosted by Digest publisher Steve Darnall and heard every Saturday afternoon (1:00-5:00 p.m. CST) on WDCB-FM (and on the internet at www.wdcb.org). 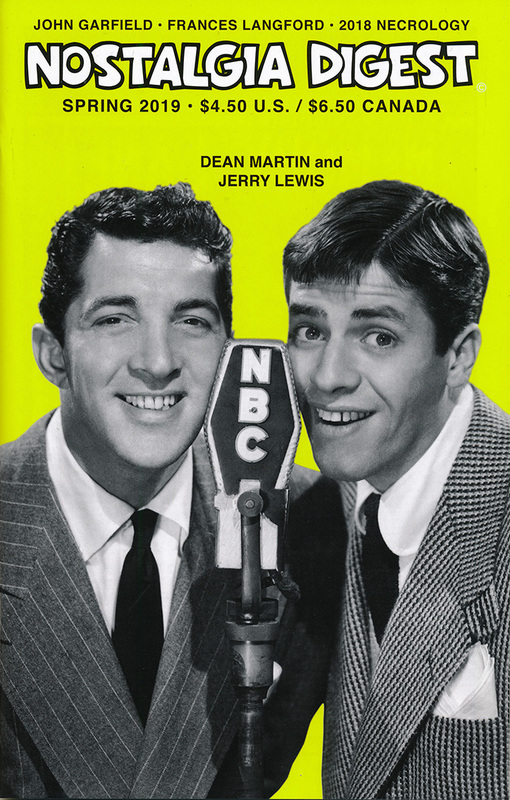 You'll find a complete listing of the old-time radio programs heard every week on Those Were The Days, including original broadcast dates, titles of stories, names of stars and supporting players, and a line or two describing each show. It's exclusive to Nostalgia Digest and a perfect complement to the stories, subjects and stars we cover in every issue--and now, Nostalgia Digest also includes the program listings for Carl Amari's Radio Theatre! Subscribe now! Nostalgia Digest makes a great gift for a friend, a loved one…or for you! A one-year subscription brings four 64-page issues to your door for only $17; a two-year subscription brings you 8 issues for only $30! A complete listing for Steve Darnall's Those Were The Days--and Carl Amari's Radio Theatre! PLUS: Our NECROLOGY for 2018; memories of Riverview Amusement Park; The Andy Griffith Show's BETTY LYNN recalls her radio and movie career; more! To order by U.S. Mail, send check or credit card information to Funny Valentine Press, P.O. Box 25734, Chicago, IL 60625 or you can call or fax your information to us at (773) 769-6575. The story of how JACK BENNY and FRED ALLEN started radio's most famous feud; the making of Casablanca; the re-invention of actor JOHN BARRYMORE; film historian LEONARD MALTIN on the stars of the silent screen who moved to television; YAKIMA CANUTT, king of the Hollywood stunt riders; more! The radio adventures of OZZIE & HARRIET! Plus, MARLENE DIETRICH and World War II; the story of STAN FREBERG's "Green Chri$tma$"; the career of actor JOHN CARRADINE; How Illinois actors conquered Hollywood; the comedy of OLSEN & JOHNSON; the saga of war-amputee-turned-Oscar winner HAROLD RUSSELL; a few moments with The Honeymooners' JOYCE RANDOLPH; more! A look at the life and career of the Yankee Doodle Dandy himself, the legendary JAMES CAGNEY! Plus, our NECROLOGY FOR 2017; the larger-than-life FATS WALLER; the Golden Age of radio soap operas; the roadside attraction of Burma-Shave; EDDIE CANTOR at war; writer MAX ALLAN COLLINS discusses the career of MICKEY SPILLANE; more! GEORGE BURNS and GRACIE ALLEN and the missing brother that made them famous; the gentleman gangster, EDWARD G. ROBINSON; the remarkable music of JOHNNY MERCER; the movie career of THE THREE MUSKETEERS; the career of actor CORNEL WILDE; memories of eating at the Automat; The WILDE TWINS and how they made their Hollywood dreams come true; a few moments with actress CHARLOTTE RAE; more! The remarkable life and career of the king of the singing cowboys, GENE AUTRY; the strange saga of BATMAN on radio; radio's top comedians on television; the career of GREGORY PECK; our NECROLOGY FOR 2015; a few moments with NORMAN LLOYD; more! FEWER THAN FIVE COPIES IN STOCK!